perfect for my beach photo! elements add on. I painted them with the Prima Finnabair Art Alchemy Opal Magic Pink Blue Acrylic Paint which has a beautiful pearly shine to it from the color add on, them embossed in areas with the WOW! 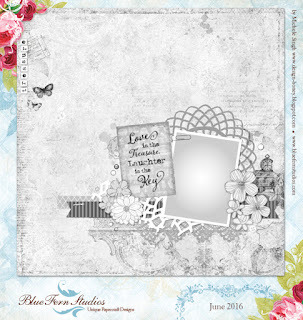 Pastel Blue Embossing Powder from the main kit. Prima Finnabair Art Alchemy Opal Magic Pink Blue Acrylic Paint that I mixed with glass bead glitter gel. I also did some splattering with Lindy's Stamp Gang mists from previous kits! What an awesome photo Laura, and it looks so good with the background paper! Thanks so much for joining us for the Blue Fern Sketch Challenge this month. What a great layout. Love the photo and the beachy paper you used with it. Thanks for joining us for the Blue Fern sketch challenge this month.